Samaritan's Purse President Franklin Graham was among those who participated in the 2016l High Country Warrior Ride. 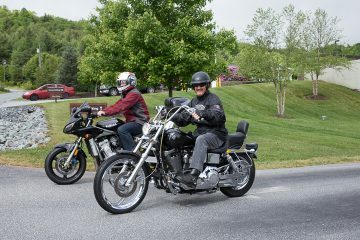 Samaritan’s Purse President Franklin Graham and more than 120 riders on close to 90 motorcycles participated in the fifth annual High Country Warrior Ride on Saturday, May 21. The 85-mile North Carolina ride from Samaritan’s Purse International Headquarters in Boone to Wilkesboro and back raised almost $15,000 to support Operation Heal Our Patriots, our ministry to military couples with a spouse injured or wounded in combat operations after 9/11. Motorcycle riders came out on Armed Forces Day to support military families through Operation Heal Our Patriots. This was the first time that Graham’s busy travel schedule allowed him to ride in the event. A long-time motorcyclist, Graham biked from North Carolina to Alaska in 2011. On Saturday, he gave participants a brief introduction to Samaritan’s Purse—”We don’t run from crises, we run to them”—and told everyone to drive safely as roads were still slick from the previous night’s downpour. “We’ll have a lot of fun today,” he said. Graham also mentioned that he and his wife Jane know a little of the stresses that military families face as their youngest son Edward serves in the Army and has been deployed overseas eight times. The Grahams are deeply and personally involved with Operation Heal Our Patriots and spend time each summer encouraging couples in Alaska. 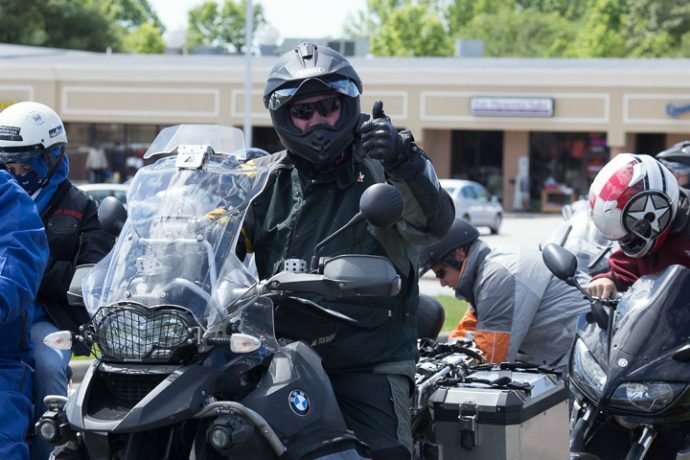 Franklin Graham gives a thumbs-up riding in the fifth annual High Country Warrior Ride. 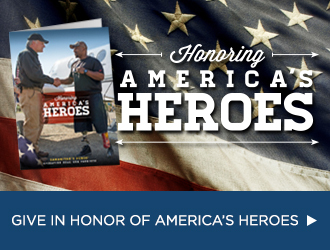 Samaritan’s Purse started the project in 2012 to strengthen the marriages of wounded service members. 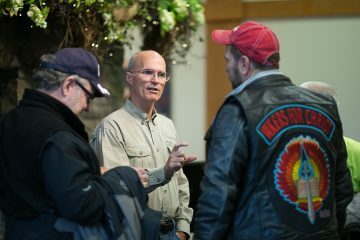 Couples come for a week of Bible-based marriage enrichment in Alaska where they participate in outdoor activities and daily classes together with our retired military chaplains. Our ministry to these couples does not end in Alaska as we follow up with them over the long term through our aftercare program. 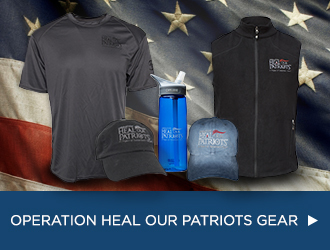 Jim Walker, a retired Marine brigadier general, serves as executive director of Operation Heal Our Patriots. He also spoke to the crowd before the ride. “If you’ve been wounded, for real, long-term healing, you need a sound foundation. That foundation has two parts: a strong marriage and a strong faith. That’s it. That’s the whole program. That’s what we’re doing in Alaska,” Walker said. Saturday’s event, which happened to fall on Armed Forces Day this year, is an annual reminder to participants of the needs of wounded veterans and their spouses. General Jim Walker, executive director of Operation Heal Our Patriots, speaks with ride participants. Organized by Western Carolina University head football coach Mark Speir, the High Country Warrior Ride has grown in popularity as riders from throughout the United States learn about this fun way to show support for military families. “It’s a great ride for our veterans who sacrifice every day … so we can enjoy the freedoms we have,” Speir said. Mark started the High Country Warrior Ride after he helped renovate Samaritan’s Purse Lodge in Alaska, the location where wounded veterans and their spouses come for marriage enrichment. A number of Saturday’s riders had previously served in the military. A love for Christ, a love for veterans and our country, and a love for motorcycling unified the group. Rider Neel Hudson from Hickory, North Carolina, served in the Air Force and came with his family and friends, including David and Jason Ingle, former Marines. Mark Speir (center), High Country Warrior Ride organizer, is committed to supporting our country’s veterans and their spouses. For many participants, the High Country Warrior Ride has become an event to look forward to year after year. Jeff Schnider, from Council Bluffs, Iowa, made a long trek to attend this year’s ride and hopes to come again in the future to show his support. His son, Jamie, served two combat tours in Iraq before his death in 2012 at age 22. Schnider was grateful that his son received Christ before going to Iraq the first time. Since 2012, Samaritan’s Purse has welcomed 526 couples into the Operation Heal Our Patriots project, 200 individuals have made commitments to Jesus Christ, and 227 couples have publicly rededicated their marriages to the Lord.